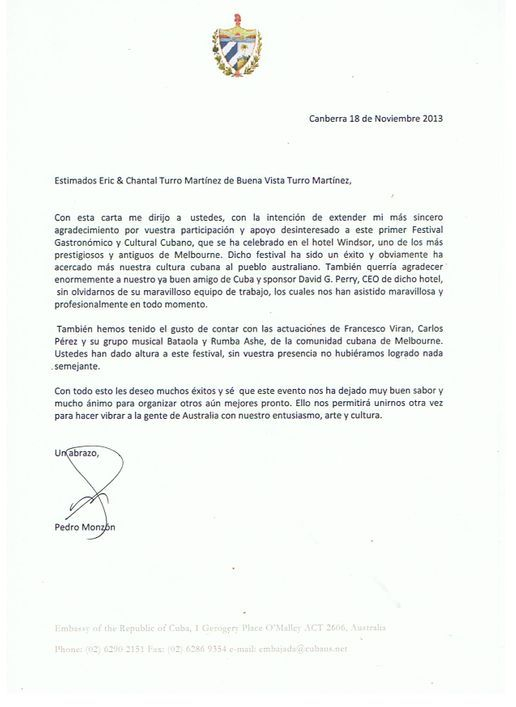 "Our purpose is to promote Cuban culture around the world, our goal is for Buena Vista Turro Martinez Int. 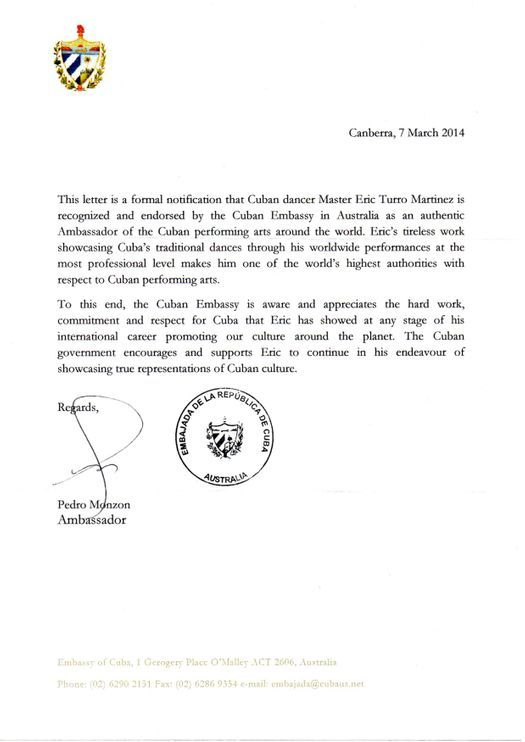 Cuban Dance & Entertainment Company to show, promote and teach the true Cuban culture." Eric Turro Martinez the King of Cuban traditional dance, he is one of the greatest traditional dancers that Cuba has ever produced. Co-founder of Buena Vista TM company, Vice president for the Fundacion International Casino Para Todos making him one of the genre's highest authorities. 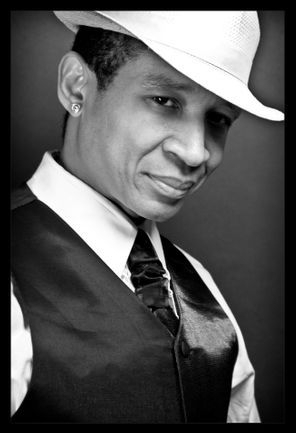 He is the man who brought Cuban traditional dance to the world stage, through the Buena Vista Social Club (2000-2005) at the Hotel National and Riviera Hotel in Havana, as well as touring internationally since 2004 with The Bar at Buena Vista and Havana Rumba shows. Eric has refined his style of Son Cubano by tapping into his strong link to the Buena Vista Social Club's old generation. His unique style makes him one of Cuba's most admired and respected around the world. Chantal Turro is a Sonera like no other. 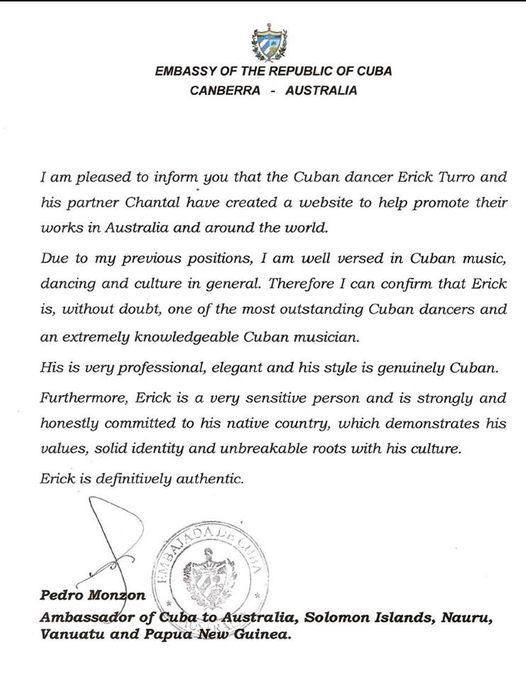 The first Australian dancer to perform with one of the largest Cuban productions,The Bar at Buena Vista. Chantal Turro has been teaching ladies styling and street salsa in Australia for the past 10 years and teaching overseas with Eric since 2007. 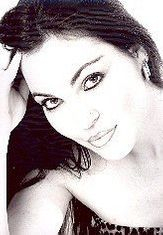 Dancing and performing from a young age, Chantal's knowledge stems from many dance styles including street Latin, flamenco , tango, jazz, tap, hip hop, west African & middle eastern. Whilst trained in many styles, Chantal credits her style more recently to the traditional Cuban dance style of Eric. Recent performances from this couple include performances with some of Cuba's finest musicians including LOS VAN VAN on their 2010 Australian tour in August, Vocal Sampling Orchestra Buena Vista, Juan de Marcos & Afro Cuban All-stars. Currently Chantal is the main dance teacher at Buena Vista Turro Martinez dance school alongside co-director Eric Turro Martinez.